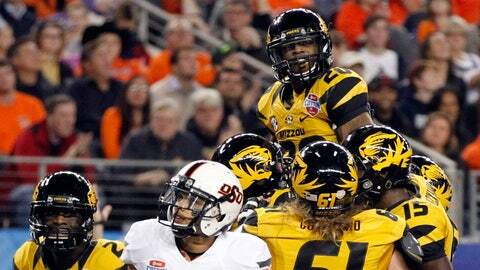 Missouri running back Henry Josey rushed for three touchdowns in the Tigers' 41-31 win against Oklahoma State in the Cotton Bowl. Back in 2007, it was Gary Pinkel’s program that stood as Cotton Bowl champions at the end of the season, 12 wins in the books and a No. 4 ranking in the final AP Poll. Led by an explosive offense featuring Chase Daniel and Jeremy Maclin (who on hand in Dallas), Missouri, then a Big 12 co-member with its Friday night opposition, had finally broken away from its streak of mediocrity in its first six seasons under Pinkel. Good times kept rolling, but that was as good as got in Columbia. Until this season. Following a disappointing 5-7 inaugural campaign in the Southeastern Conference, the Tigers looked like the lesser of the two newcomers — no Johnny Manziel to hang their hat on (unlike fellow conference newcomer Texas A&M), a select few cracks in the East division’s upper echelon of Georgia, Florida and South Carolina. But behind a relentless defense and a formidable offense highlighted by an effective rushing attack and skyscrapers for receivers, Missouri kept winning. Game after game. Against Oklahoma State, though not its most impressive showing of the season, particularly on offense, those same pillars held steady: the defense held the nation’s 12th-ranked scoring offense to eight punts, three turnovers and a missed field goal while the offense averaged 5.6 yards rushing on 47 attempts. In the end, the Tigers ran away from coach Mike Gundy’s explosive team, one that put up 17 fourth-quarter points and even took a late lead before All-American Michael Sam strip-sacked Cowboys quarterback Clint Chelf to spark a scoop and score for the game’s final points. On the national scale, only one other team (Auburn) upstaged Mizzou’s turnaround effort in 2013. The cries for Maty Mauk were loud and justifiable. Through three quarters, the redshirt freshman quarterback had led Missouri on its most explosive scoring drive — a six-play, 80-yard composition highlighted by two 30-plus yard scampers and a gem of a touchdown pass to receiver Marcus Lucas — while Franklin, a senior starter, was stuck in the middle of one of the worst games of his career. On multiple occasions, his inaccuracy and indecision served to nullify the Tigers’ effectiveness in the running game and keep Oklahoma State alive and kicking. But Pinkel kept calling on No. 1. And as Oklahoma State continued to bring pressure and shut down passing lanes, he continued to search for an opportunity. Finally, with his team trailing for the first time in the game, patience was rewarded: Franklin stood up to a fierce pass rush and found star receiver Dorial Green-Beckham behind the Cowboys’ coverage for a 27-yard play to set up the go-ahead score by running back Henry Josey. When the clock struck zero, his final line was ugly, one of the ugliest of his illustrious career: 15-of-40, 174 yards and an interception. But the Tigers stuck with him until the end. It paid off. Fortunately for Franklin, his rushing attack was spectacular. Josey capped a highlight-filled junior season with 92 yards and three scores as the team racked up 256 yards on 47 carries in the game. It was enough to question why the Tigers decided to throw the ball 40 times, given Franklin’s troubles. All the same, one of the most decorated QBs in Mizzou history went out with a win he had to scrap for. As if Franklin’s final line wasn’t bad enough, it could have been much, much worse. With the game knotted up at 24-24 in the fourth quarter, Franklin took a shot down the middle of the field toward Green-Beckham that ended up in the hands of defensive back Tyler Patmon, who subsequently took it back to the house and sent an orange-clad crowd into a frenzy. Only problem: the play was called back on account of a penalty. Patmon was called for pass interference on Green-Beckham, a call that the Oklahoma State coaching staff certainly found worth debating — on replay, it appeared there was some contact before the pass reached its destination, but not to the extent that a flag had to be thrown — as it would have completely changed the entire complexion of the game. With Franklin struggling and Chelf & Co. beginning to find a rhythm, the pick-six could have served as a de facto game-winner. Instead, Missouri used the penalty to drive down for a field goal (taking the lead, 27-24). Oklahoma State would take the lead on the following possession on Demond Roland’s two-yard run, but that field goal prevented the Cowboys from taking a definitive lead and possibly putting the SEC challengers away. Much has been made of the SEC’s dominant run of BCS national titles — seven straight, in case you haven’t heard, going on eight as Auburn takes on Florida State on Monday — but the conference’s run through Big 12 competition in the Cotton Bowl precedes it. Missouri’s win over Oklahoma State gives the SEC 10 wins in 11 Cotton Bowl contests dating back to 2004 (when Ole Miss beat Oklahoma State). The only Big 12 win during that stretch? Missouri’s takedown of Arkansas during that 2007 season. Overall, eight different SEC teams have claimed the Cotton Bowl title since 2004.